We have a full range of students from 4yrs old and from the lowest grade right up to 2 Black Belts, with every grade in between. Our classes are designed for fun, fitness, self-improvement and for those wishing to compete at any level. Our students had considerable success at our VTA competition earlier this year and came back with 9 Medals, 3 of them being Gold! As with any Martial Art, we also teach Self Defence, both from a syllabus perspective and for use in Real-Life situations. Weald TKD offer a variety of courses for children as young as 4 years old. These courses teach life skills through fun activities and role playing games. The children learn how to deal with Strangers, Bullies, Emergencies and Day-to-Day Dangers, Building their Self Awareness and Confidence at every stage. At the end of each term we have a grading which gives the children the chance to show off what they have learnt and earn the next grade, badge and certificate. Additionally, each lesson they will receive a sticker to go on their attendance sheet, which shows how many lessons they have attended throughout thee year and how they performed per lesson. At the end of the Caledar Year, we hand out awards and attendance certificates for this age group. The children’s class for 7 years and above are ideal for kids requiring “Personal Life Skills” including Self Discipline, Confidence, Goal Setting and Respect. Our classes are a great way for your child to release extra energy in a safe, fun and constructive way. As well as learning to kick and punch in a controlled environment, your child will benefit from our professional attitude and positive role models. Martial arts training can be an essential part of your child’s development, helping to prepare them for real life. Adults can also gain new skills, develop their confidence, work on their fitness, flexibility and concentrate their power and channel any aggressiion into pad work and board breaking. Additionally, our instructors have to attend a Bi-Annual Instructor's Course, First Aid Course and carry the appropriate level of Insurance. Feel free to ask to see these should you wish! 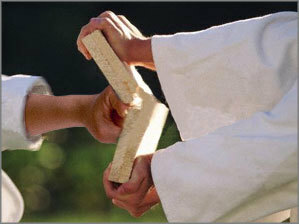 With appropriate technique comes great power and we channel this into pads, shields and eventualy boards and bricks as the student progresses. You will learn techniques that, with practice, will help to give you confidence to be aware of your surroundings and deal with these scenarios. The competition side of sparring takes several forms, non-contact, point scoring and pre-arranged sparring between a pair of students or more. This is where you really build your skills and experience, testing yourself against others. These are the fundamentals of movement, breath control, power and continue throughout your training, learning new movements and their application.